Supernanny Icon: Aibileen Clark | Y'all Behave! Children, on an almost universal level, are always seeking some kind of approval. Some are hoping to feel treasured, others to feel smart, still others to feel that they are a good little person. Some want to be all three, some would be happy for any praise sent in their direction. Welp, enter Miss Cheryl. I am monumentally magnanimous when it coms to doling out accolades on my charges. I praise them to help establish their self-confidence, but mostly I pay them compliments because they are true. 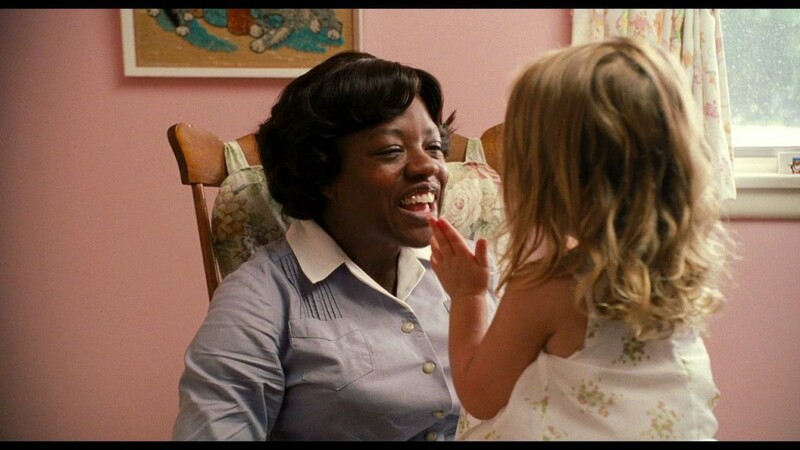 Watching The Help, I was so moved by the relationship between Viola Davis’s Aibileen Clark and her charge, Mae Mobley whom she calls “Baby Girl”. In every scene with Mae Mobley, Aibileen’s whole body language changes, into a mode of care and comfort. She’s definitely a Supernanny! She tries so hard to shield the toddler from the harsh realities of the world, including her own neglectful mother. She becomes the closest person and chief caregiver to Mae Mobley, with “Baby Girl” even saying at one point, “You my real mama, Aibie.” The scene when Aibileen and Baby Girl are forced apart is one that is heart wrenching to watch; the bond between them is so strong. 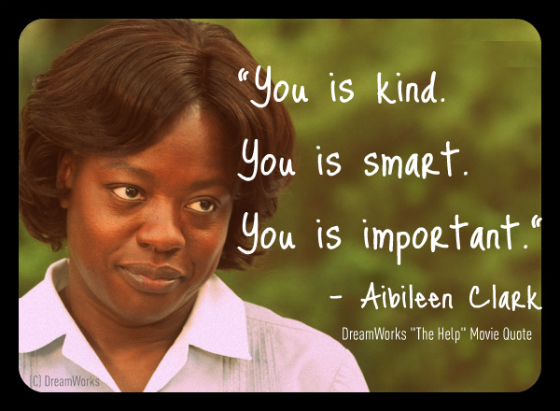 Aibileen’s parting words and characteristic mantra, “You is smart. You is kind. You is important,” is one I hope I leave the kiddos with. With Boss Lady, I literally cannot help myself from complimenting her constantly. I do not, by any stretch of the imagination, want her to base her self-worth on physicality alone, but as Marilyn Monroe’s Lorelei Lee so famously observed in Gentlemen Prefer Blondes, “Don’t you know that a man being rich is like a girl being pretty? You wouldn’t marry a girl just because she’s pretty, but my goodness, doesn’t it help?” (wink, wink) In Boss Lady’s case it is impossible not to notice what a beautiful child she is. When I get her dressed, brush her teeth, comb her hair- her long lashes, mischievous smile, and general adorable air warrant constant complimenting. My only hope is that she doesn’t expect this kind of puffing up from all adults she meets. (Though in her case she may not be disappointed!) As a woman, I know how important it is not to place all emphasis on looks; I want Boss Lady to have confidence in her amazing personality, and in the future to surround herself with people who appreciate her intellect. Boss Lady is hysterically funny. Humor requires a unique kind of intelligence, and I am constantly wowed by her hilarious hijinks. Now looks and sense of humor are a dynamic duo in any one person, but Boss Lady’s admirable qualities do not stop there. She is also the sweetest. She’s affectionate, empathetic, such a loving little person. She is a lover of all animals, especially her canine(on the outside) brother, Bugs. I can only imagine the amount of times she hears how pretty, smart, funny, sweet, perfect she is between time spent with me and her two doting parents who, by the way, get the biggest kick out of her, love her originality, value her every thought. It’s wonderful to see. Making sure that children feel that they are special, that they are noticed, that they are loved, helps instill confidence that lasts a lifetime. I know my own parents never skimped on the compliments, always making me feel that I was the smartest, sweetest, most beautiful girl in the world. There have been times in my life when my self-esteem has been tested: in past relationships, competitive atmospheres, social situations; but spending any amount of time with my mama and daddy always restores my faith in myself, and reminds me that I am smart, I am kind, I am important. And to feel that, is the biggest Help of all. 🙂 they’re quite a pair!